Cleaning your heating and cooling ducts is an important part of your household maintenance. Imagine all of the dust, allergens, and objects that can collect in your ducts over the years. This can reduce the proper distribution of air throughout your home, resulting in uneven heating or cooling. Consistent distribution of heating and cooling; hence, more constant temperature throughout your home. Improved air quality; hence, reduction of respiratory and allergy related illness. Reduction in your energy bills; hence more money in your pocket. 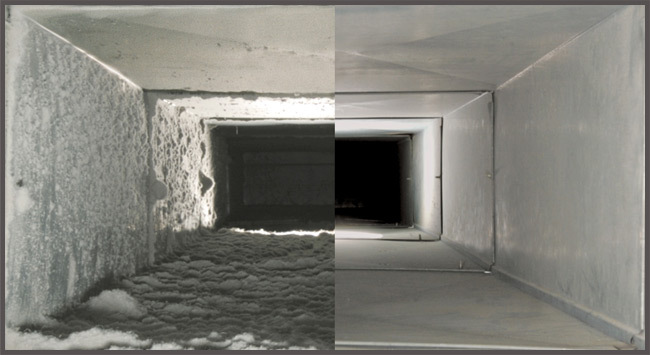 AirZone offers straightforward pricing on our duct cleaning, along with a 100% quality guarantee! We take our time to make sure the job is done correctly the first time, and offer top quality professional service. We go the extra mile to show you how great of a job we are doing cleaning your duct work. Please Note: Our Duct Cleaning service is only available in the Ottawa area. A standard home typically costs $350 – $550. We would be happy to provide you with a free estimate for your home, and show you why AirZone HVAC Services offers a higher quality of customer and installation services. Studies have shown that indoor air can be 2 to 5 times MORE polluted than outside air. Most disposable filters remove about 10% of these pollutants allowing 90% to enter the air system, even during the construction of a new home. The pollutants contain dust, pollen, mold spores, animal dander and much more. These materials collect in the furnace, air conditioner and duct surfaces, just as they do on the furniture and floor surfaces. The furniture and floor are cleaned regularly but the duct surfaces are hidden from view and can only be reached by specialized duct cleaning equipment. These pollutants can migrate out into the room again, or become a food source for mold and bacteria, which can thrive in this dark comfortable environment from high humidity or moisture from the air conditioner or humidifier. Biological growth can release mold spores or toxins into the air system. There are 3 major parts to an air system: 1. The supply and return grills; 2. The interior surfaces of the supply and return vents; and 3. The furnace / air conditioner air handler. All 3 components must be cleaned. If only one or two of the components are cleaned, the contaminates from the 3rd component will rapidly contaminate the ones that were cleaned. Once an air system is thoroughly cleaned, it should remain clean for 3 to 7 years if properly maintained and a high efficiency filter is installed. A standard disposable filter only stops about 10% of the airborne contaminates, allowing 90% of the dust in the room to flow back into the air system. To maintain protection against biological growth, an EPA registered biocide should be applied every 6 to 12 months by a qualified Duct Cleaning Professional such as AirZone, and a UV light installed. This can depend on a lot of factors, such as the size of the home, the number of supply ducts, how long since the ducts were cleaned, etc. The whole system should be cleaned and a more efficient filter installed to keep the system clean longer. AirZone offers extremely competitive rates and a standard home generally runs around $350 – $500.